Today was organized chaos. 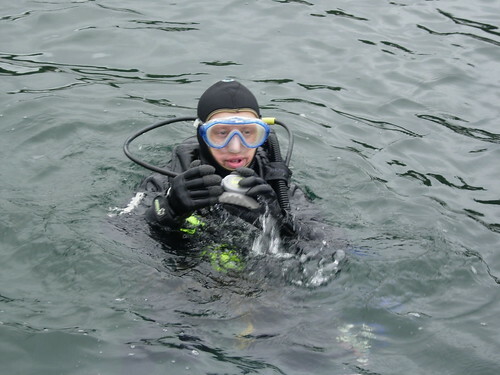 We had Peter K. and, his daughter, Charlotte who had had resort courses but hadn’t ever been diving in New England water and wanted to get certified as Scuba Divers. We also had Dianne Kelleher and her friend, Jim, who hadn’t ever scuba dived, but wanted to try it. Plus, we had Laurent Dubois and Richard Brandolini who are excellent divers already. I chose the beach at Kettle Island for Peter K. and Charlotte, with Pat Walsh. Peter Donahue, The Captain, Dianne and Jim used the stern of the boat for their exercises. I had anchored in 18 feet of water over a sandy bottom. Laurent and Richard swam to the point to hunt. It was a multi-purpose site. The water was 55 degrees on the surface, with about 10 feet of visibility at 20 feet. The sky was partly cloudy and there was a 10 knot breeze from the ENE. Charlotte had a little trouble clearing her ears as we tooled around in about 10 feet off the island’s gently sloping beach, but the skills she’d learned in her resort course were still there. Peter was good at everything. We decided to move for the second dive and went over to Diver’s Leap for the next site. I anchored in 22 feet of water. It was a little clearer here because the tide was coming in. It was 50 degrees at the bottom, with 10-15 feet of visibility. Peter K. and I practiced descents in open water and bouyancy control on the bottom. Pat and Charlotte worked on the down line, wrapping their legs around it, dropping feet first, and going slow to allow Charlotte time to concentrate on clearing her ears before they hurt. Peter and I were there to greet them, just by accident, as they hit the bottom. Cheers were pantomimed and great huzzahs bubbled out too. She did it! Richard and Laurent disappeared on the hunt. Charlotte emptied a tank while hanging onto the swim platform, so she’d know what it feels like, and that it isn’t an instantaneous thing. The air doesn’t just stop in mid-breath. I think I saw the sides of the tank bowing in as she drained it. Peter K. and I practiced orally inflating and deflating the vests we were wearing. Everyone did fine and we all had fun. The wind was gusty from the northwest and there were rollers coming in from the south. Not a good combination, no matter where we would be trying to dive. We drove around the island to check out the options. Not surprisingly, there were not many. The customer roster morphed a lot from what we’d been expecting. When the dust settled, there were Jacki K. and Andy along with Jim Castelli, Pat, Pete, me, and The Captain. We decided on the backside of Kettle Island for calm water, with protection from swells and wind both. The visibility was only about 10 feet – less if the lobster-hunters had just gone through. The resident crab population was also stirring things up by digging holes in the soft silt and sifting in the debris for food. They were being watched by scads of teeny flounder which were less than 1/2 inch long, just in case they dropped anything tasty. The water was 55 degrees at 20 feet. According to Peter, it was 50 degrees at 40 feet. Jacki and Andy were happy with the site, so we were too. We moved across the cut to the mainland for the second dive. We could see that the incoming tide had Saddle Rock awash. Pete took Jacki and Andy over to it so they could see the beautiful underwater landscape around the rock. I videoed the wall behind the rock because the tide was high enough to let the water cover several different layers of underwater growth. The gray/orange granite got darker when it was wet and then, down further, the barnicle zone was white shells glistening in the dappled light from the surface of the water. Deeper still, the growth on the wall was orange/red until it joined the first area of sea weed. As the water surged against the wall, I could see the under side of the wave, curling and breaking with silver bubbles. Lovely. Peter returned with a great big lobster that was almost too big, but not quite. What a monster. He was happy with this site, so we were too. We had Patrick Scalli, Joe Finkhouse, and Laurent Dubois on a day with heaps of sunshine and hardly any wind. What could be better? How about home-made, gourmet, tomato tarts? Veronica, Pete, Pat, and The Captain joined me and the customers in munching them all the way to crumbs between our two dives. Oh, yeah. The dives. Well they were cold – 50 degrees. But clear – 15-20 feet. The first one was at Stone Garage. It faces south, so choosing this site in late summer makes the day seem warmer and the water clearer. Plus, you can navigate by swimming into the sun to get deeper and away from the sun to return to the boat. That must have been what Laurent did because we noticed bubbles wa-a-a-y-y out to sea. They couldn’t have been his, he vowed. Yeah, right. Pete brought us a sea raven to admire on the swim platform. Then he posed with it as Pat took its picture. If I get an email of the best shots, I’ll post them for your admiration. It was hard to tell who’s scruffier looking – Pete or the sea raven – but I’ll go with the fish because Pete was wearing his ice mask. Cue the snacks. Veronica brought “legal” ones for us as well. The second dive was just a little further east. We’d never anchored there before and I wanted to try a new site. It was 20 feet deep, still cold, and a little less clear. We could call it Post Tomato Tart Nothing Special. It had some large boulders, but it also had lots of kelp. The lobsters were thumbing their noses at us. Plus it had more surge than the first place. I videoed two pretty sea ravens. One was red and the second was gold/yellow. Then the surge started getting to me. I surfaced to see Patrick Scalli tooling around the boat in bright yellow Force Fins. The Captain had obviously gotten to him. Pat drove home and navigated us under the Blynman Cut bridge at full outbound tide without mussing her hair. Nice job. Thanks to everyone for a beautiful start to fall, if you can relate to that oximoron. Today was supposed to be very warm, but it never measured up. It was shorts and a tee shirt weather, however, and that was a pleasant surprise for late September. As The Captain and I had breakfast at Morning Glory, overlooking Gloucester Harbor, the fog and breeze from the south dictated a trip to the north with our group of Emily Cox, Teresa Herd, Laurent Dubois and Dianne Kelleher. Everyone wanted to hunt lobster, so Peter agreed to coach Emily and Teresa, while Laurent and Pat went on their own. The Captain and I were videoing anything that looked interesting, so we didn’t care very much where we went as long as the conditions were surge-less with good visibility. I chose Fisherman’s Canyon for the first stop with the hope that the vast areas of open, naked rocks would prove good for hunting. Well, the kelp has taken over that open expanse of rock. I anchored in 20 feet of water over what had been beautiful, pink, coraline algae-covered, boulders and cliffs. Dianne and the others confirmed that the contours were still wonderful, but everything was kelp-ed. The lobsters won. Laurent said it was 50 degrees at 55 feet – he swam straight east from our anchorage, but never surfaced out there. Pete said it was 55 degrees at 20 feet with visibility in the 10 foot range. I saw that Straitsmouth Island looked good for our second site, so we traveled across Sandy Bay to the little cove on the north side of the island. Again, I anchored in 20 feet of water. Here the visibility was gorgeous in the shallow cove – about 20 feet or more in 15 feet of water. As you swam deeper, it got poorer until it was about 10 feet in 30 feet of water. The temperature was 55 degrees again. Teresa and Emily saw a large sea raven, we think. “A big head, tapering down to a narrow body, with growths and dark reddish” sounds like a sea raven description to me. I saw a three inch long fish with alternating bands around its body of black and white and with a bright yellow head. Haven’t got a clue what it could have been. I also saw six too-large lobsters in dens as shallow as 10 feet. Pete and his team caught them all and, according to him, so did Pat and Laurent. The tide was falling and, as we left, the edge of the Irish Moss zone was coming in to view. It looked golden in the low angled sun all along the edge of where the ocean met the rocks of the island. No waves, no swells, and no passing boat traffic disturbed the pattern of shimmering yellow at the ocean’s margin. What a winner of a day! Thanks to Bill Low, we have documentation of the trip we made last Saturday, September 15th. Thanks, Bill, for taking the time to send these along. What a difference from yesterday. Today was total sun, gentler winds and a less bouncy ocean. We went south because the wind was from the north. We wanted some variety, so we turned left at the end of the Dog Bar breakwater and anchored on the south side of Milk Island off Rockport’s Pebble Beach. We hadn’t been to this site in at least five years, so it was new to lots of folk. Linda Giles and Myanna, Joe Finkhouse, Bill Low, and Laurent Dubois were hunting or sightseeing or practicing navigation. Tim Maxwell was working on his NAUI Instructor tasks with The Captain, Veronica, and me. Pat was crewing and lobstering and Peter, The Magnificent, was telling everyone what to do. I anchored in 20 feet of water over rocks and sandy patches. I could see them from the flying bridge. The Captain sent Laurent in first to scout the place and he came to the surface in a few moments with a legal lobster in his hand as he placed it on his head to say “OK!” That set the tone for the hunters. I got suited up and, upon descending, quickly saw the visibility was at least 20 feet. I could see ripples on the surface from the sandy patch where Fred and Tim were simulating a class on regulator retrieval. Later, I got to video a little bit and found that every large boulder had its own corona of teeny, tiny fry. They were reddish and some still had distended bellies that looked like yolk sacks from their egg phase. Pete thought it was late for them to be just hatching now, but I couldn’t believe they were anything other than new babies. Veronica said she saw the largest lobster she’s ever seen and it was eating another one. The hunters returned with happy faces. The water had been 55 degrees at 30 feet. The second site was just a little more towards the east, along the same side of the island. It was 22 feet and the visibility was down to about 15 feet. There was more surge here and more huge lobsters. They were too big to take, but awesome to come across as you topped a boulder. Everyone had stories to tell about their encounters. We were glad to have such easy-to-please customers. It was supposed to be damp this morning and then clear up, and become breezy. There was drizzle, rain, grey clouds, and then more rain and the promised wind. You didn’t miss anything if you weren’t able to join us. Except, Jacki and Andy were surrounded by curious stripped bass behind Kettle Island. Andy noted they were skittish about being lit with his flashlight. Pete saw “teen-aged” sea ravens, and a bevy of four inch flounders. There weren’t enough of them to actually be a school. It was more like a small class of them, according to Pete. Loads of lobsters, they were crawling everywhere. They were on the sand, trying to hide in the depressions they make. They were on top of the rocks; they were beside the rocks; they were under the rocks. They were in lobster pots, under lobster pots, on top of the lobster pots, and on their way to the lobster pots. It was a free-for-all of lobsters (most of them were shorts, but it is still fun to see them). As had been his plan, Laurent Dubois caught enough of them to feed his “grand tante”-in-law and her family. Bill Low and Larry Fine were exploring in the warmish water – 57 degrees. They reported visibility from 5 feet to 15 feet, depending on whether you’d been following a lobster hunter or not. We pulled the anchor to motor to the second site and the wind picked up to usher through a front of rain and clouds. The white board where we display the numbers of lobstering divers flew off its perch on the ladder on the starboard side of the boat. We were half way to the site and turned around to find it on the surface near the island. What a surprise to learn that it floats! Turning once again for the second site at Saddle Rock, the wind picked up briskly and the rain was arriving sideways. I was driving in full foul weather gear and getting blasted in the face by the wind/water. I shouted down to see if anyone wanted to call it quits with one dive for 1/2 price. There was a chorus of yes votes. So, it was one and done. We hope for better conditions tomorrow. It thundered and lightening-ed over night and rained hard too. It was still dribbling as we awoke. But it got a lot cooler and continued to drizzle as we loaded the boat. The wind was from the east and we decided to go back to Kettle Island for protection from the elements. Jamie Kent, Tim Maxwell, Laurent Dubois, and Richard Brandolini were with us today. Pete and Veronica were crew. Pat is still on Martha’s Vineyard on vacation. Jamie was going to make his first open water dive of any depth, so I anchored in 28 feet of water behind Kettle Island. Veronica squealed as she jumped in, so I knew right away that the water temp had dropped from last weekend. She and Jamie descended the down line as he learned how to clear his ears. Tim practiced bailouts from the swim platform. Laurent and Richard hunted. 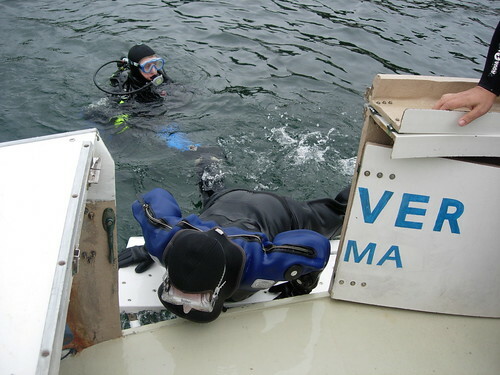 After the dive, Veronica reported that her thermometer registered 45 degrees on the bottom. But was it ever clear – about 30 feet of visibility. We made the second dive right across the way at Diver’s Leap. That’s a joke because the land entry is an impossible height above the ocean and would entail a monster giant stride. Laurent and Richard hunted some more. Jamie, Veronica, Tim and I went for a little jaunt over to the rocks and back. He saw critters and practiced buoyancy control. The visibility was excellent again at only 20 feet. We were kneeling on the bottom and I could see ripples on the surface. The bottom was littered with sand dollars. There were also baby cunners on the rocks, moon snail egg cases, hermit crabs, and little lobsters. Thanks to Veronica for bringing “legal” snacks. It was slated to be over 90 today. I think it made it. Breezy from the southwest, with low rollers to boot. Nothing too bad, though, so we went south to Kettle Island for the hunters. Because of some last minute cancellations, we only had Laurent Dubois, Larry Fine, and Tim Maxwell. Tim is a NAUI Instructor candidate and practiced skills and bailouts behind the island in about 15 feet of water. Pete said it was 50 degrees at 30 feet with about 30 feet of visibility. We moved over to the shelter of the west side of Magnolia beach for the second dive. Again, we were interested in getting the best hunting grounds we could. Larry did well, as did Laurent. The depth was 24 feet with the same 50 degree water and excellent visibility. We had a visit from a seal, although it didn’t come close enough for an introduction. Laurent pointed out its head about five boat lengths east of our anchorage as we waited for the last diver to surface. As I dashed for the video camera, it dove and left the building. Today, we had a double-header – a second trip after we docked from the first. This was just into the Gloucester Harbor and shallow, sandy-bottomed water off Niles Beach for the beginner’s second class. The NAUI Instructor candidate and the NAUI Scuba Diver candidate were accompanied by two NAUI Instructor Trainers/Course Directors as they practiced scuba skills in stand-up water. The mix seemed to work fine. It’s supposed to thunderstorm tonight and be much cooler tomorrow. Labor Day was beyond beautiful. Cloudless sun, stiff southwesterly breeze, low humidity, and great people combined to make it one of the nicest dive days of the season. 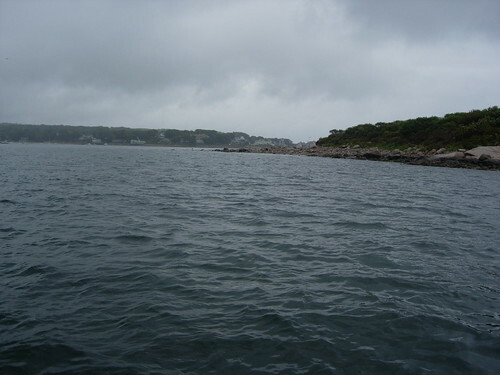 We were happy to leave the swells behind and make our way up to Folly Cove on the north side of Cape Ann. We had a new person – Ed Stopa – from Rhode Island who had never been there. Laurent Dubois, Larry Fine, and Dianne Kelleher were OK with diving there, so I anchored in about 35 feet just at the little point where most shore divers turn around and start back. We were amazed to watch Ed don so little neoprene as he suited up. 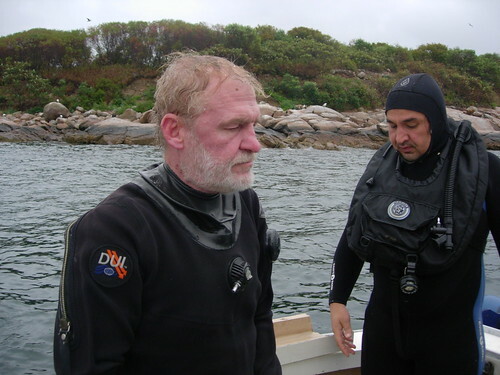 He had a step-in, long-sleeved, shortie over a dive skin and wore a small, neoprene, water polo cap with thin, warm-water gloves, and regular wet suit boots. That was it. He was in the water for 50 minutes and it was 59 degrees at the surface and 45 at the bottom at 57 feet. The thermocline was at about 40 feet. Visibility was “better than Rhode Island,” according to Ed, who had won a trip on Easy Diver via Deb Greenhalgh’s Divers for Hope program. We thought it was about 10-15 feet, depending on whether a lobster hunter had crossed your path. We just motored to the other side of the cove for our second dive. I anchored in about 35 feet in front of the Lobster Pool restaurant. Here the bottom was large boulders and the lobster hunters had a better time and more success than they had had on the first dive. Laurent caught a large, gold-colored pollack by hand. He said it had been under a rock and when he approached it with his lobster bag open, he was able to coax it into the net without it realizing it was being trapped. He brought it to the surface to general acclaim and then let it go again after everyone had admired it. What technique! Next time he tries it, we’ve agreed I’ll be nearby with the video camera running. The dive ended too soon and we were off back down the river to get cleaned up for Pete’s annual Labor Day cookout. There were going to be lobsters for lunch, I heard.